I was really impressed when I got the CD version of the first official album by this highly promising new Russian psych rock band to review in 2014. I just loved The Cosmos Inside! It was recorded in 2013 and previously released by the band the same year on download. Clostridium Records in Germany did the wise move and released it on vinyl later in 2014. Dave from Sulatron Records is also famous for spotting the greatest new psych bands very early so here's the new vinyl-only release on glorious limited orange vinyl with groovy psych art by Lulu! As the title suggests, this release includes some stuff recorded prior to Cosmos Inside but also some tracks recorded in 2014. The eight tracks still form a very tight and amazing whole without the feel of being a compilation of out-takes or anything like that. In fact, I love this just as much as Cosmos Inside! Polska Radio One might have a bit stupid or not the appealing name, but they're just great. They manage to get inspired by a lot of stuff like original 60s psych rock, space rock, shoegaze and even post rock and jazz and make it all sound like their own. They can write some catchy melodies, use a lot of mind-altering effects, synths and even sitar, have strong tendency for groovy beats and tight bass lines, know how to rock out and also how to create atmospheric, uplifting soundscapes. The songs are pretty hypnotic and ecstatic. 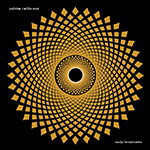 On "Radio Motorik" they get very krautrock-like in the vein of Neu! and I like that too... They seem to sing in Russian and English, but that's somehow irrelevant in this kind of music. It's very hard for me to pick out any favorites since I really haven't heard any bad songs by this band. Just get the album and try by yourself, I'm sure you will love this stuff too!